I can't believe that June is over. I only have two months left until I have to go back to uni and I'm not looking forward to it at all :( this means that the next two months will consist of many blog posts and days spent at work trying to get myself out of beauty and fashion debts haha! 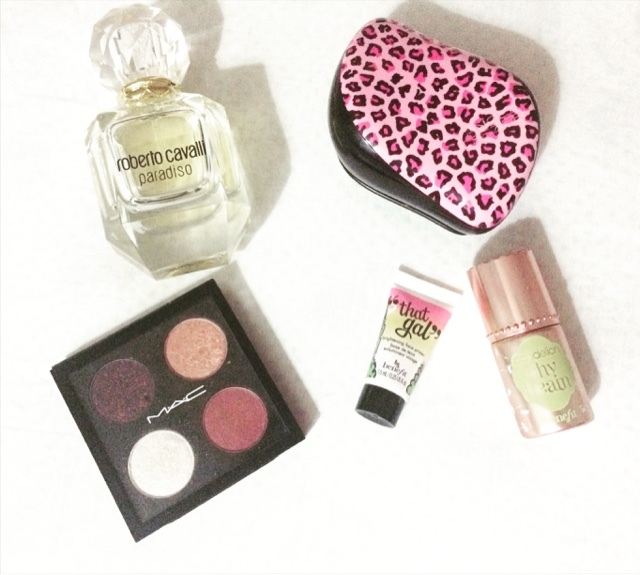 On the other hand, here are some of the products that I've been loving the past month. Roberto Cavalli Paradisso Perfume, Compact Tangle Teezer, MAC Eyeshadow Quad, Benefit Cosmetics "That Gal" and Dandelion Shy Beam. I particularly have been loving those products as they are what I think of when someone says 'holiday products', especially the R Cavalli perfume. I've had my Tangle Teezer for a couple of years now I think and there's not been a day that it let me down. I use it religiously on a daily basis and it's great to use on wet hair, especially once you've come out the pool/sea. The Dandelion Shy Beam is probably my favourite matte highlighter of all time. I only bought it a few months ago, probably within the first week of its release and I've been loving it ever since. I think it looks great on with a matte smokey eye so there isn't too much going on. On the other hand, "That Gal" primer was the very first benefit product I fell in love with 7 years ago when I tried it on. It smells amazing and makes my face feel super soft as well as gives me a natural glow. Last but not least, my trusty MAC Eyeshadow Quad. I bought the Pro Palette separately to the refills so I could make my very own small palette. I think you could really work with it and create many looks with using only 4 shadows. My palette includes the shades: Crystal Avalanche, Beauty Marked, Mythology and Cranberry.